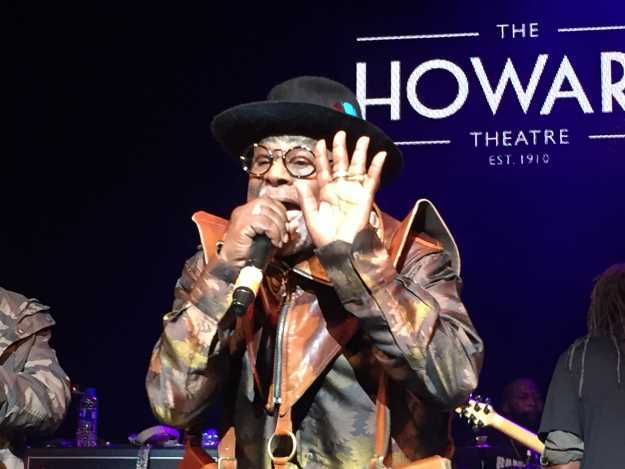 George Clinton performing with Parliament Funkadelic at the Howard Theatre, February 15, 2018. Photo by William Powell. George Clinton, legendary songwriter, bandleader, and record producer, at 76 years young, put on a rapturous, stunning, extraterrestrial funk fest at the Howard Theatre on a warm February night in Washington, D.C. The audience of Clinton and his band Parliament Funkadelic was a delightful mix of the aged and the not-so-aged, all races and walks of life, but essentially the young at heart. With over a dozen musicians and dancers on stage at any given time (creating a circus-like atmosphere), Parliament Funkadelic played their musical hits, old and new, and morphed them into meandering, musical, sentimental journeys, to the point that the original songs were unrecognizable. Like movements in a classical composition, Parliament Funkadelic’s songs alternated between everything from a big band feel, to rock, funk, and R&B – creating unique worlds within each tune. Clinton (also the author of a fantastic autobiography) made his spectacular entrance on the stage wearing a white robe and Viking-like, horned crown, and from there changed into a majestic-looking brown leather jerkin-like shirt and signature, black fedora. Clinton’s focus seemed to be on highlighting members of his band, often pointing at and cheering them on. One of his favorites was the scatting and horn-playing Greg Thomas, who also had a standout performance at the band’s 2004 show in Montreux, Canada. Tall, portly Baltimore, Maryland native Bennie Cowan had a nice trumpet solo and provided delightful notes all night. The show, presented by radio station Majic 102.3, was theatrical to its core, with band members wearing funk costumes and pulling ladies on stage to dance. Sir Nose, aka Carlos MC Murray, wearing his floppy white hat and pants, performed funky moves and handstands to the music. Renditions of ’70s and ’80s hits, “One Nation Under a Groove,” “Flashlight,” “Not Just Knee Deep” and “Atomic Dog” were the strength of the show. Clinton and Parliament Funkadelic kept the (mostly standing) crowd at Howard Theatre grooving and waving their hands throughout the concert. No concert would be complete without an opening act, and indie-funk-rock band Miss Velvet and the Blue Wolf served that purpose well. The band’s set included several funk-rock tunes including “Dare”, a hit in Germany. Lead singer Miss Velvet provided a stunning, soulful cover of “Summer Time.” George Clinton & Parliament Funkadelic always deliver concerts that stand on their own as memorable works of art. Music lovers from nine to 90 should make every effort to boogie down to their show when this magnificent band comes to town. Running Time: Four hours, with no intermission.